Super Monkey Dash: Go Bananas! – Now Available on the App Store! Monkeys love bananas, help them collect them! Super Monkey Dash: Go Bananas is fun and creative platform game where you control the cute little monkey to collect bananas and reach the goal! To get the highest score possible, collect all the bananas in each stage before time runs out! Like all of my other games, Super Monkey Dash: Go Bananas is 100% free. Everything in the game can be unlocked through game play alone, no purchases required at all. Hours of gameplay, with more to come soon! Interesting stages that can be easy to complete but challenging to perfect. 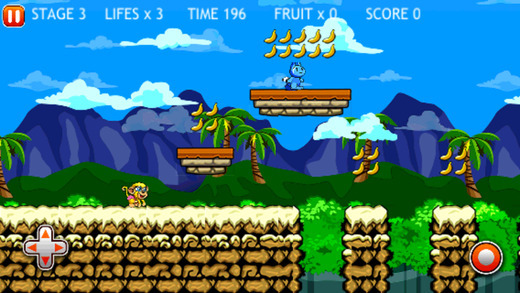 Super Monkey Dash: Go Bananas has two versions available, one for the iPhone/iPod and an HD version available for iPads! Download them today and enjoy!